shop joielle: Introducing Our Sample Loaner Program! Introducing Our Sample Loaner Program! In only a few years, online shopping has evolved into an incredibly comprehensive buying experience, and here at Joielle, we are constantly making improvements to provide all the information we can about our products. But we also understand that sometimes you just need the peace of mind of seeing a dress in person before making a final decision, especially when it involves a whole bridal party. 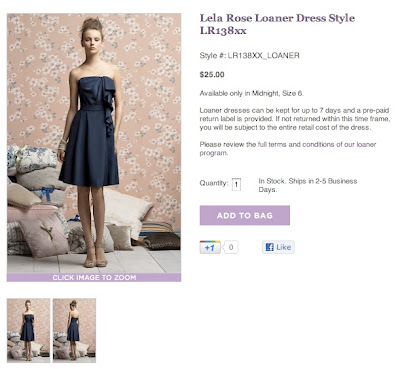 So we have decided to launch a limited Sample Loaner program, beginning with the Lela Rose and Social Bridesmaid lines. Here's how it works. Select the "Sample Loaners" link under the Women's "Shop by Style" section. Voila! All of the samples that we own will be displayed. You can put them in your shopping bag just like a regular dress and it will ship out to you in 2-5 business days. 1. The fee is $25 per dress, plus $10 flat fee shipping which covers return shipping. 2. Loaner dresses can be kept for up to 7 days and returned using the pre-printed shipping label included in the box. 3. If a loaner dress is kept past 7 days or not returned in original condition, you will be subject to the entire cost of the dress. 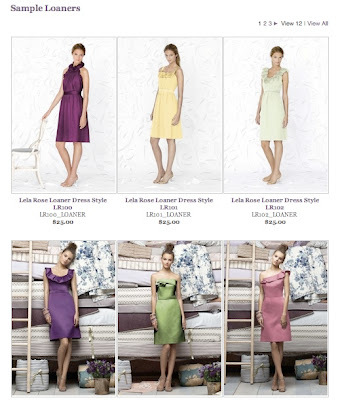 Please note that each style is only available in the color and size noted on the product page. In the event that the dress is out on loan, you can contact us to be put on the waiting list and we'll let you know as soon as the dress is returned to us. We will be adding select styles from other lines in the coming weeks, so feel free to contact us if there is a dress you are looking for!